"Fake news" has exacted a high cost to American culture and political discourse, but the internet fakery that costs you time and money is phishing, emails diabolically aimed to trick you into opening your personal data to crooks and miscreants. Reply email address. 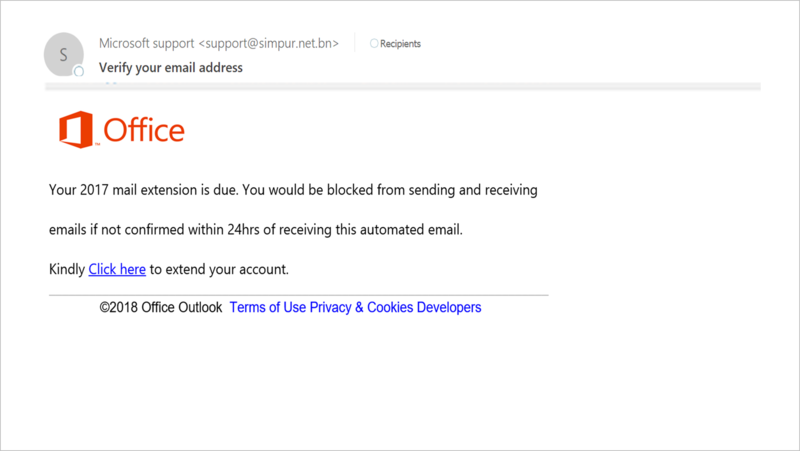 In this phishing email, the reply address at the top left says "Microsoft support," but if you look closer, the reply email address is "support@simpur.net.bn" and that is not a Microsoft address. The "bn" suffix is the internet country code for Brunei, and that's another telltale sign of fraud. Clever phishing emails often fake reply addresses in other ways. The easiest way to verify a reply email address is to double click on it and look at its properties. If the email purports to be from Microsoft or Google, will hitting reply send an email to a Microsoft or Google email account? If not, it's fake. Links. Don't click on links in a suspicious email without being deliberate. The link could be a malicious website. Right click on the link and check its properties and see if the link goes to the company. Slow down. The grammar, misspelling, bad links, and other telltale signs are easily overlooked when you're in a rush, and that's perhaps the reason why people become ensnared by phishing emails. Verify before you trust. Trust but verify works for some things but not with internet security. First verify and then you can trust. Secure Software. Microsoft and Apple release updates to computer operating systems continually and those are essential to staying secure. Anti-virus and anti-malware programs are also essential and they need to be kept updated with the latest fixes.